Magnificent eating in Rouen the other night – showing that at least in some quarters the French bedrock of technique and flair still exists…. 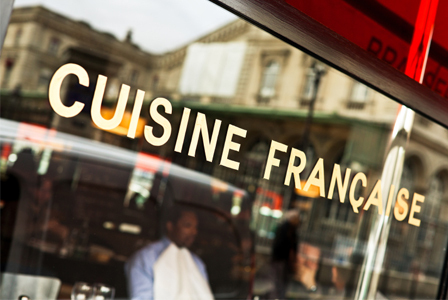 I’ve mentioned before my sadness at the decline of French bourgeous restaurants – something that was the pride and hallmark of the nation in prior years. Kitchen quality and technique has dropped significantly (largely so that untrained or low-skilled cooks can be used), and the menu pricing forces you into paying for a unnecessarily large 3 course meal. In the UK or US we have become accustomed to being able to order a single, well-cooked and imaginative dish for a reasonable amount of money, or having a light meal of one or two appetizers if that’s what we want. It’s really hard to do this in France. That’s odd because who wants a three course meal with wine at lunchtime if you are at work? As a result, when at our French place we eat almost exclusively at home these days , but when in transit we have to eat out. We break our journey in Rouen these days. This is a very attractive medium sized city of around 500k inhabitants and the 13th largest in France. It’s famous for it’s magnificent cathederal, and also houses one of the finest church organs in Europe at St Ouen. I’ve written previously about drinking habits there, but everything about the place shows how France is changing. For example, when we venture out in the evening for dinner, the most common visibly identifiable activity of the people we pass in the street, is eating, buying, or carrying home pizza. The number of people you pass who are carrying pizza boxes is quite remarkable. 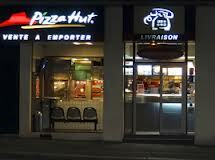 Likewise the most popular restaurants are those that offer modern takes on things like pizzas, burgers and tartines. Clearly most (young) people need something quick, fast and tasty. They are not of course getting that from the classic bourgeous restaurant – which is why they are under such pressure these days. For our part, we are not looking for a haute cuisine experience when we break the journey – just something interesting, reasonably priced and not too massive in quantity. That rules out about 80-90% of the restaurants in the city. At the pinnacle, sits the 2 rosette Gill restaurant – legendary, and expensive. We’ll eat there one day, but not when we are en-route on an overnight stop. The chef and owner,Gilles Tournadre, has two other more reasonable places in the city, Le 37, and Gill Bistro Cote (of which more later). We have tried these and several other spots in the city, and I have tramped the streets and looked at dozens of others. The problem is the menus again. They mostly force you into a 3-course minimum of say 35-65 euros, while a la carte items are priced so as to discourage you from ordering them. At la Couronne, a well known place on the Vieux Marche, the 3-course menu is 35 euros, while a single main dish from it is 36 euros. Essentially they are saying – want just one dish? P*sser off! Since the actual food looks uninspiring and conveyor-belt driven, I always give this restaurant a miss, but sadly it is representative of most of the mid-level places in town (I don’t eat pizza or burgers). But back to Gill. While his le 37 restaurant falls into the above category (although the food itself is quite nice) Gill Bistro Cote is quite a different animal. The place itself is cool and understated. If you look very closely at the pic on the left, you can just make out the sign for example. Inside it has a very New York or London feel, with most tables arranged for two people, nice lighting, and no chintz (which Rouen is otherwise stuffed with). Its taken me a while to get to grips with the menu, but the main thing about it, is that everything is priced separately (although there is a well priced non-option menu at around 22 euros). And the cuisine on its day offers that elusive but wonderful quality of deep technique and tradition, combined with modern presentation and intensity of flavour and taste. One evening I had an appetizer of bulots – just a vast plate of whelks, with aioli and good bread. Brilliant, and earthy and unlike anything available in London. The other excellent thing about Gill is that they serve most main courses with just a beautifully prepared green vegetable. Classic French cuisine, for some reason seems to ignore green vegetables – so you invariably get meat or fish with potatoes and some tiny decorations scattered about, but that’s it. That heavy and vitamin-free style is not for me and it’s another thing that puts me off the majority of Rouen places. Oh and one other thing about Gill Bistro – the service is superlative. Friendly, not obtrusive, but always there, and fast. So what’s not to like about Gill? Well, we often end up eating on Sunday night in Rouen – and just as most food shops close at lunchtime in France, many restaurants close on Sundays (and often Mondays). 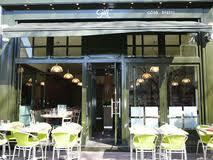 Gill to their credit is open every night, but we have noticed it’s not the crack team in the kitchen on Sundays. The food has been, let’s say unremarkable on a few occasions. 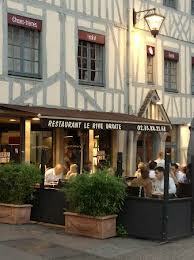 So we have started going to the Rive Droite, also on the Vieux Marche but on the south side. 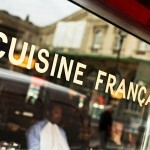 This place has the same characteristic as Gill, well priced interesting dishes available singly. While the outside is half-timbered and fussy, inside it’s cool and modern. And they offer a great poele (pan fried) fois dish for 10.80 euros, with a simple sauce, (no compotes of kumquat) – an absolute bargain. Their dishes are simple, and again earthy and super reliable in quality, without ever getting to the heights that Gill will achieve. They also have a much better selection of wine by the glass than does Gill. But we were beginning to miss Gill, so this last trip, which involved staying on a Tuesday night, we went back there – and they really excelled themselves. 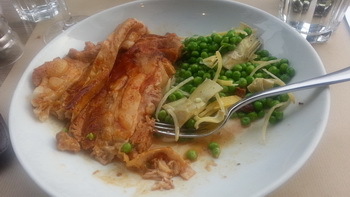 We both ordered poitrine of veal with peas, artichokes and confit lemon, and it was ambrosial. Poitrine is a sort of belly slice not really sold in the UK, and is really hard to cook well, as it’s fairly tough (but flavourful) and dries out if cooked for too long. This though was meltingly tender, deep in flavour, moist and succulent. And served as you can see with julienned confit lemon rind in the vegetables, which added acidity to balance the richness of the meat. I have tried for years to cook this kind of cut (it’s widely available in Cape Town) without much success. I thought it had to have been done sous vide and when I asked how it was cooked they said yes, 8 hours at low temperature. No fuss, no elaboration on the fancy method in the menu description but in practice cooked with huge care and attention to detail. Bl**dy perfect in fact. 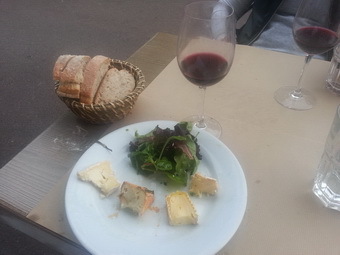 And this washed down with the bargain of their wine list, a 50cl carafe of excellent Bordeaux at 13.50 euros. I had started with a very fine slice of terrine of tete du porc, served with sauce gribiche (chopped hard-boiled eggs, cornichons, capers and herbs) and salad, and unwisely (I was in appetite overrun mode after the plat), ordered cheese. I only mention this to illustrate how perfectly in tune with what I want Gill is. It arrived, with just a plain green salad and a knife and fork. The cheese was not straight out of the fridge, nor had it been standing around at room temperature for days. A perfectly judged selection simply served, with no adornments and exactly what I wanted (I eat cheese always with salad, without bread, and using only a fork). As with the pic above by the way, I had eaten half of it before I remembered that I should take a snap. But you get the idea. There is one more place I have in mind in Rouen that seems to offer a similar arrangement – this is called La Chabada, and I hope to try it on our return trip. But for now ,Gill having excelled itself has restored the reputation of France in my mind and indeed stomach, so all is well with the world.